Convex Diamond Set Wedding Ring — Form Bespoke Jewellers Ltd.
An edgy sparkling wedding ring, diamond set on a convex edge! Starting from a flat court profile, this ring then had both edges shaped to make them convex. For this bespoke wedding ring, one edge is fully set with round brilliant cut diamonds. The diamonds have been grain set and the metal is highly polished for an added sparkling illusion. On the opposite edge, there are no diamonds. Instead the convex profile has been polished to provide a stylish contrast with the satin finish across the top of the ring. The inside of the ring also has a polished finish to complement the convex edges. As a bespoke jewellers, we can create almost any design for your bespoke wedding ring. We love it when a customer chooses to add stylish details to their ring! A polished or satin finish, both edges diamond set, set with colour precious stones, the details are entirely up to you. 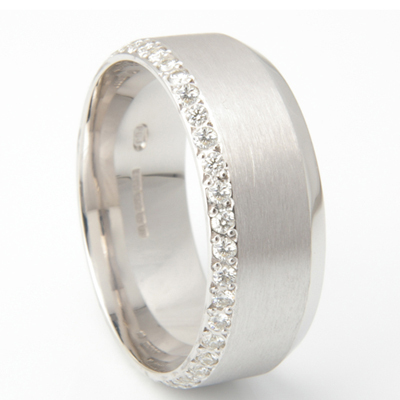 We create your wedding ring to suit your individual requirements.